When Brisbane’s German Silva attends the canonisation of Blessed Oscar Romero in Rome on Sunday, he will remember “many key messages” the saint offered throughout their five-year friendship. Source: The Catholic Leader. As a teenage catechist in El Salvador, Mr Silva was influenced by Blessed Romero’s humility. “I’ll never forget Msgr Romero said catechists must respect the teachings of the Church, as the messenger, not the message,” Mr Silva said. The Sunnybank parishioner said the archbishop preferred to be addressed as Msgr Romero because of a desire “to be known as a brother in Christ”. Blessed Romero’s humility was seen in his frequent visits to poorer regions of El Salvador, Mr Silva said. “He went everywhere, especially to shanty towns,” he said. During the political unrest and military oppression of El Salvador’s civil war in the 1980s, an uprising began against unjust work and living conditions. 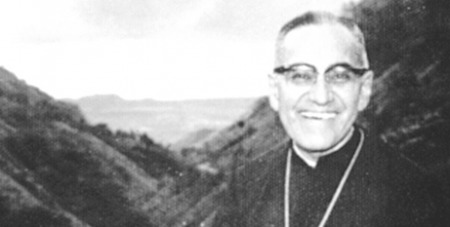 Blessed Romero was martyred celebrating Mass in a hospital chapel in El Salvador on March 24, 1980, and more than 200,000 people attended his funeral six days later. He will be canonised along with Pope Paul VI on Sunday.